This review is for the second volume of Gosick by Kazuki Sakuraba (with art by Hinata Takeda). The English edition was released by Tokyopop in March 2010. The remaining novels of the series were never localized (with seven left to go for the main story). But enough of what we don’t have; let’s take a look at this second volume here. It’s generally what you would expect of a follow-up to the first volume: same sort of design for the cover, same quality for the lovely B/W interior artwork, and same amount of editing for the text itself. I feel the translation for this second entry flows a bit better than the first did, but the amount of grammatical errors seems to have unfortunately increased. It wasn’t bad enough to make me quit reading, but it does leave the impression the project was a bit rushed. 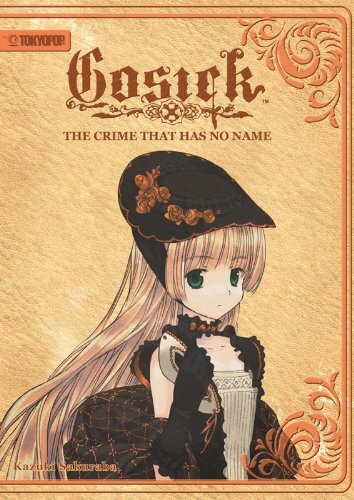 The mysteries themselves are not what stand out in this volume, or for Gosick in general in my opinion. It is fun to try working out the who, how, and why of each mystery, but what always kept me reading were the amusing and cute interactions between Kazuya and Victorique. We get to learn quite a bit more about the two characters in this book, making them that much more dynamic than they were in their first adventure. While we get to understand better why Kazuya is in Europe and about his family situation, the hints regarding Victorique’s own family situation and why she is always in the “library prison” paint a picture that grows a little clearer… but also a lot larger in scope. While this volume and the first each tell a self-contained story, The Crime That Has No Name clearly hints at much more to come–and as of now the only feasible way to get the full story is through the anime. (I was going to say “the only official way,” but it seems the anime is no longer available on Crunchyroll…) With all that in mind, I will strongly suggest giving the anime a try–and if you’re a fan, see if you can find the two LNs for a reasonable price! Used copies seem to be going for outrageous prices at the moment, so you might have to conduct a pretty dedicated search. I love the anime and enjoyed the first LN volume very much. So I really, really want to read this . . . but I can’t find a copy that’s not, like $100 or thereabouts. It makes me very sad. Some genius, wonderful publisher needs to pick up this series (and re-translate the first two volumes sans the grammatical errors, please). Yes, Gosick and certain other older LNs have become more difficult to find, and sellers are being ridiculous with their prices. (Luckily I was able to get the two Gosick volumes for dirt cheap a couple years back…) Maybe try checking some local libraries? They usually have online databases you can look at.